Bill Clinton (born August 19, 1946), by-name of William Jefferson Clinton, is an American politician who served as the 42nd President of the United States from 1993 to 2001. Before becoming president, Clinton served as the Governor of Arkansas for 12 years. In this position, his most notable achievement was improving the state’s educational system. As President, Bill Clinton oversaw the longest period of peacetime economic expansion in American history. Among other things, he overturned a deficit of $290 billion in 1993 to a surplus of $236 billion in 2000; brought about a significant drop in unemployment and poverty rates; and regulated the increasing crime rate through the largest crime bill in American history. In foreign affairs, Clinton helped negotiate the Oslo Accords between PLO and Israel; and helped end the Bosnian War. 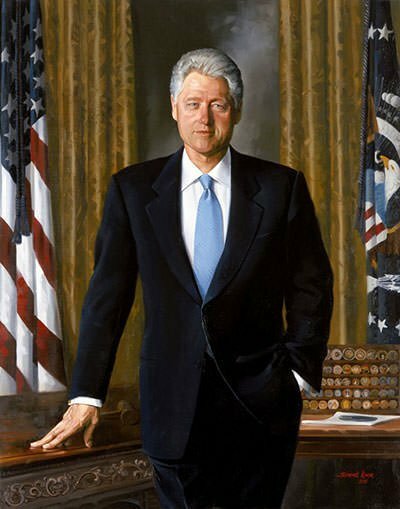 Know more about the contribution of Bill Clinton through his 10 major accomplishments. After graduating from Yale Law School, Clinton returned to Arkansas and won election to the Attorney General of Arkansas. He served in this position from January 3, 1977 to January 9, 1979. 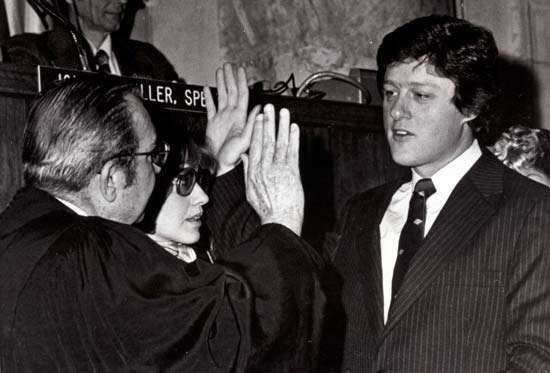 In 1978, at the age of 32, Clinton was elected Governor of Arkansas. He became the youngest governor in the country at the time as well as the second youngest governor in the history of Arkansas. In 1982, he was elected governor a second time and kept the office for ten years. Clinton served as the 40th and 42nd Governor of Arkansas; from January 9, 1979 to January 19, 1981 and then from January 11, 1983 to December 12, 1992. During his term as governor, Clinton helped transform Arkansas’s economy and improved the state’s educational system. His educational reform included more spending for schools, better opportunities for gifted children, vocational education, higher teachers’ salaries, more course variety and compulsory teacher competency exams. In the United States presidential election of 1992, Democrat Bill Clinton defeated incumbent Republican President George H. W. Bush. Clinton won 43.0% of the popular vote as compared to 37.4% for Bush; and 370 electoral votes to Bush’s 168. In the 1996 presidential election, Clinton was re-elected, receiving 49.2 percent of the popular vote and 379 electoral votes. He defeated Republican Bob Dole, who received 40.7% of the popular vote and 159 electoral votes. Bill Clinton was the first Democrat since Franklin D. Roosevelt to be elected president more than once. He served as the 42nd President of the United States from January 20, 1993 to January 20, 2001. Soon after becoming president, Clinton signed into law the Family and Medical Leave Act (FMLA) of 1993. The Act required employers to provide employees with job-protected and unpaid leave for qualified medical and family reasons including pregnancy and serious medical conditions. The economic policies of Bill Clinton, referred to as Clintonomics, helped create conditions for a record 115 months of economic expansion. 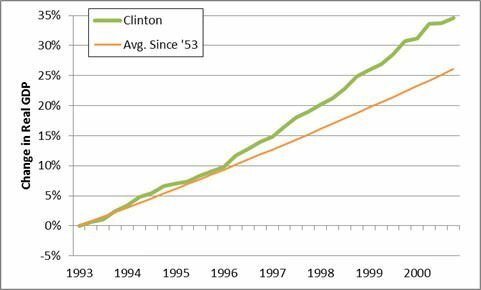 During Clinton’s tenure from 1993 to 2001, the economy grew at an average of 4% per year. Bill Clinton inherited a deficit of $290 billion in 1993 and it was expected to grow to $455 billion by the end of his term. To cut the deficit, the Clinton administration pursued both tax increases and spending cuts. Through the Deficit Reduction Act of 1993 and the Balanced Budget Act of 1997, the federal government experienced the first budget surplus since the 1960s in 1998. During the last three years of Clinton’s presidency, there were budget surpluses of $69 billion in 1998, $126 billion in 1999 and $236 billion in 2000. Bill Clinton presided over a period of low inflation and low unemployment. More than 22 million jobs were created in the 8 years under the Clinton administration. This was more than that were created in the previous 12 years. 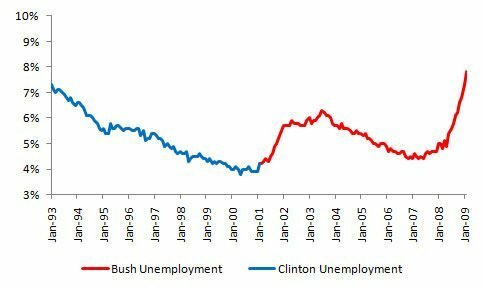 Unemployment dropped from more than 7 percent in 1993 to 4 percent by the end of Clinton’s term in November 2000. Unemployment for African Americans and Hispanics fell to lowest rates on record and the rate for women was the lowest in more than 40 years. The poverty rate also dropped from 15.1% to 11.3% over Clinton’s tenure from 1993 to 2000. This was the largest drop in poverty in nearly 30 years. By the year 2000, there were 7 million fewer people in poverty than in 1993. The poverty rates for single mothers, African Americans and the elderly dropped to their lowest levels on record while child poverty rate declined by more than 25%. Education was an area of major focus during the presidency of Bill Clinton. Areas which saw remarkable progress include implementing standards and accountability; improving student performance; expanding access to technology; and making higher education more affordable. Reading and math scores increased for 4th, 8th and 12th graders; the number of charter schools grew from 1 to more than 2,000; the number of states which had standards in core subjects grew from 14 to 49; and federal investment in education and training doubled. Also, there was a 3,000 percent increase in educational technology funding and the number of schools connected to the internet increased from 35 percent in 1994 to 95 percent in 1999. When Clinton took office, the crime rate in the United States was increasing steadily. Starting in 1987, the homicide rate had increased by 5% each year, peaking in 1991 with 9.8 deaths per every 100,000 people. 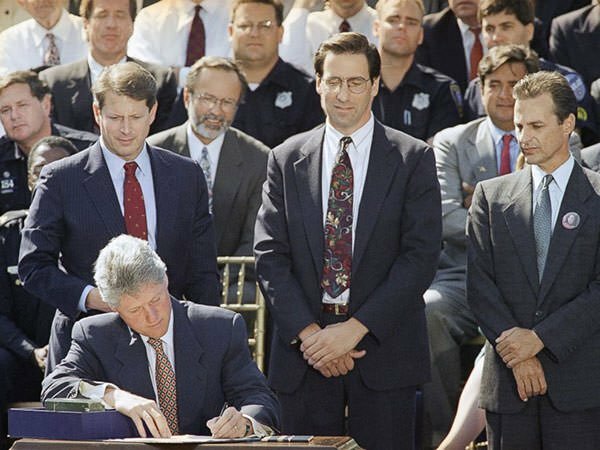 On September 13, 1994, Bill Clinton signed into law the Violent Crime Control and Law Enforcement Act of 1994 to deal with crime and law enforcement. It was the largest crime bill in the history of the country. It provided for 100,000 new police officers, $9.7 billion in funding for prisons and $6.1 billion in funding for prevention programs. Among other things the Act established a federal three-strikes law that enhanced criminal penalties for repeat offenders. It also included a provision called the Federal Assault Weapons Ban that prohibited the manufacture for civilian use of certain semi-automatic firearms that were defined as assault weapons. The Crime Bill of Clinton led to the decline of crime rate for 8 consecutive years and in 2000 it was at the lowest level since 1973. The North American Free Trade Agreement, or NAFTA, is an agreement signed by Canada, Mexico and the United States. When Clinton took office, the NAFTA had been signed but it hadn’t been ratified. Though there was significant opposition to NAFTA, Clinton administration’s effective lobbying campaign helped it win ratification in November 1993. NAFTA eliminated most tariffs on products traded between the three countries. It fundamentally reshaped North American economic relations, driving unprecedented integration between Canada’s and the United States’ developed economies and Mexico’s developing one. In a 2012 survey of leading economists, 95% said that on average U.S. citizens benefited from NAFTA. In addition to NAFTA, the Clinton administration negotiated approximately 300 trade agreements with other countries. 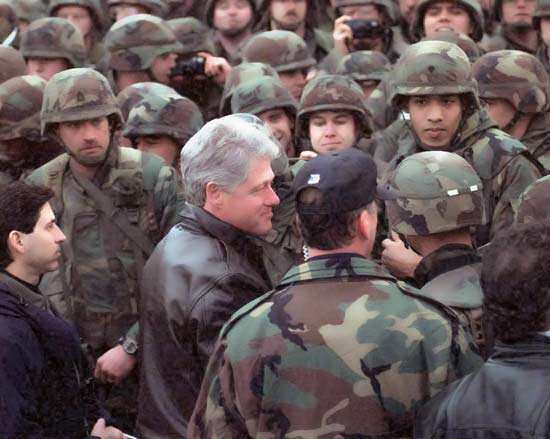 Clinton’s foreign policy in his first term was dominated by the Bosnian War. Bosnia and Herzegovina, a nation in southeastern Europe, had declared its independence from Yugoslavia, a multi-ethnic state. This led to a war between Bosnian Serbs, who wanted Bosnia to remain in the Yugoslav federation, and Bosnian Muslims and Croats. The Bosnian Serbs conducted ethnic cleansing campaigns which provoked world condemnation. In response, Clinton put pressure on western European countries throughout 1994 to take strong measures against the Serbs. He was ultimately able to win support for Operation Deliberate Force, a sustained air campaign by NATO against the Bosnian Serbs. The operation forced the Serbs to agree to peace talks. This led to the Dayton Agreement in 1995 which put an end to the Bosnian War and divided Bosnia into two autonomous regions. In September and October, 1994, the Clinton administration organized a successful effort to reinstate Haitian President Jean-Bertrand Aristide. Aristide had been ousted in a military coup in 1991. Bill Clinton also tried to play the role of a mediator to resolve the dispute between Palestinians and Israelis. 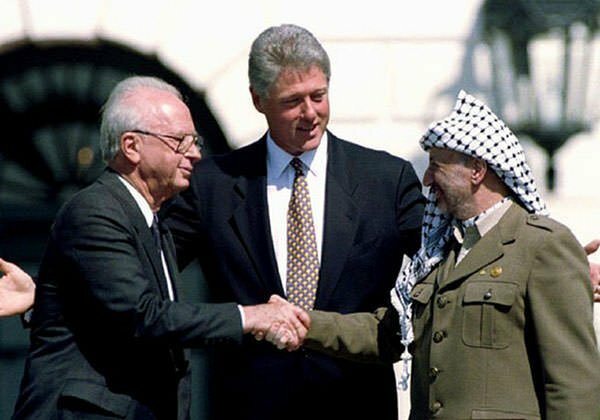 Israeli Prime Minister Yitzhak Rabin and Palestine Liberation Organization chairman Yasser Arafat signed the Oslo Accords in Washington, D.C., in 1993. Israel accepted the PLO as the representative of the Palestinians and the PLO renounced terrorism and recognized Israel’s right to exist in peace. Other important agreements of the Oslo Accords included granting limited Palestinian self-rule in the Gaza Strip and Jericho. Though the Oslo Accords were hailed as a major breakthrough at the time, Israeli-Palestinian violence had begun once again by the time Clinton left office. Clinton left office with the highest end-of-office approval rating of any U.S. president since World War II. He is usually ranked by historians and political scientists as an average to above average president. During the presidency of Bill Clinton, the home-ownership rate in U.S. increased from 64.2 percent to 67. 7 percent; the median family’s income rose by $6,338, after adjusting for inflation; the bottom 20 percent saw the largest income growth at 16.3 percent; the number of families owning stock in the United States increased by 40 percent; and the infant mortality rate dropped from 8.5 deaths per 1,000 in 1992 to 7.2 deaths per 1,000 in 1998. After leaving office, Bill Clinton has been involved in public speaking and humanitarian work. On November 20, 2013, President Barack Obama awarded Clinton the Presidential Medal of Freedom, the highest civilian honor in the United States.